The Distracted Driver (1980); Field Study (1980) an installation for three monitors & three video players ; The Chance Meeting (1981). Work with the Videokalos Image Processor began in my second undergraduate year in the film and Television school at the London College of Printing with the development of a single screen tape Horizontal & Vertical, completed in 1978. Deliberately avoiding the use of highly saturated colours, I chose to work with monochromatic hues to differentiate the passages between sections. Originally shot in black and white using a portapack, Horizontal & Vertical and subsequent tapes in the same series (Scanning, On The Pier and Clockwise and Counter-Clockwise, 1978-79) explored colourising, mixing and image-wiping functions using the Videokalos as a self-contained video mixing and image-processing device. Recorded in an exterior location, the resultant video tapes were subsequently reprocessed in the studio. During the post-production phase, the ‘raw’ video recording was displayed on monitors, rescanned via monochrome studio cameras and fed into the Videokalos IMP and ‘looped through’ (i.e. fed in sequence from one input into the next) the additional input channels of the image processor. As the input channels could be treated separately, it was possible to adjust the video images (chrominance, contrast, luminance, etc.) in relation to each other, mixing through channels in sequence during the recording session, building a final tape in ‘real’ time via a ‘live’ mix. Thus each tape was the result of a ‘best take’ process produced after a number of trials and rehearsals, the colours and transitions (mixes and wipes) gradually introduced across the duration of the tape. In using this process I was influenced both by the configuration of the Videokalos, and by the working practice of it’s designers, Peter Donebauer and Richard Monkhouse. As with a number of the video imaging tools developed by the Vasulkas, for example, the origins of the image-processor as an outgrowth of practices derived from audio technology (including the overall “architecture”) and ‘live’ broadcast television were also inherent in the Videokalos. I was conscious of the electronic nature of the video medium, and interested in establishing ideas about the relationship between the ‘natural world’ and the technology I was working with. At the time, video was far less portable, and subsequently much of the image manipulations and interventions I was interested in working with were accomplished at the post-production stage. I was particularly interested in the idea that certain technical manipulations specific to video- an enhanced perception of the video raster and scan lines, the shifting colours, the video wipes which played with the horizon line, and the punctuating rhythm of the deliberately maladjusted vertical hold (Influenced by the mesmeric power of Joan Jonas’ Vertical Roll, 1972) could have aesthetic significance. Using a slow contemplative pace with a gradual shifting of movement, colour and tone I sought to make a landscape work which, through its use of duration and the manipulation of basic video elements, made reference to a contemporary sense of a mediated experience of landscape, and to the subjectivity of the individual viewer. I also wanted the work to refer to its medium of transmission, to develop a language particular to video with reference to the subject matter (in this case, the ‘natural’ landscape elements) it was representing. I was also very conscious of wanting to make something, whilst entirely and obviously video, that had no relation to broadcast television, either in terms of its content, form or in terms of its intentions. I wanted to make a work which was emphatically ‘video’ but just as clearly not TV. Working with the Videokalos was a way to gain control of elements within the video ‘frame’. Film-makers including Malcom Le Grice, working with the optical printer, or Stan Brakhage, who drew directly onto the film surface, were able to control the level of signification within the frame, orchestrating the film at every level. I had yet to see the work of the Vasulkas, who had developed ways of delving within the video frame in works such as Caligrams (1970) and Matrix (1976). Although aware of Paik’s distorted television sets, I understood these works as substantially manipulations of broadcast television. I was seeking a line-by-line method of working with the video image, and at that time, the Videokalos offered me the closest possibility. By working with and gaining control of image brightness, contrast, colour changes and, in later work such as The Distracted Driver (1980) and The Chance Meeting (1981) image keying, I was able to manipulate the unfolding of the video image across time, beyond the basic cutting that I had been able to achieve in the edit suite with The Viewer’s Receptive Capacity (1978). After graduating from the LCP in the summer of 1979, I was committed to continuing my video work, and sought to find ways to fund it and to build a context for my practice. I joined London Video Arts, becoming a member of the steering committee, involved with selecting work for distribution and screenings at the Acme Gallery in Covent Garden. Offered an informal short-term teaching fellowship at the LCP, I was able to continue my work with the Videokalos. My brief was simple- to continue developing new work and to make myself and the work I was producing available to interested students. Since the completion of the teaching fellowship at LCP , I had been unable to make use of the Videokalos, and recent work on The Room with a View prompted a consideration of ways to acquire one for my own studio. There was nothing more appropriate to my needs available at the time which would allow me to get ‘inside the frame’ in a similar way. I lacked a method of manipulating and controlling the colours and contrasts of the video image, and the Videokalos would facilitate this, additionally providing a method of mixing, keying and resizing (‘masking’ and ‘wiping’) the image. My concerns at this point were not clear, but I understood that the video image was not constituted by individual frames in the same sense that film was. I knew video was fundamentally a continuum, a fluid signal which conceptually at least suggested that a hard transition, or ‘cut’ was a filmic imposition, a device that whilst convenient and effective, went against the ‘grain’ of my chosen medium. I intuitively felt that the work I had done with the Videokalos was simply a starting point, and I needed to further explore its potential. Central to my ideas about video at this time was a belief in an accessible and flexible working situation. The rationale to the development of my studio was the need to have complete control over the entire production process. The ‘off the peg’ price (£8,000) of a new Videokalos IMP was out of my reach, and I approached Peter Donebauer with the proposition of building one under his supervision, and Peter proposed the purchase of his prototype and, under instruction, restore it to operating condition. 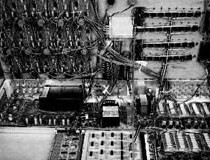 For twenty-five days between January and May 1982, I worked under Donebauer’s tutelage to repair and restore the prototype synthesiser. His instruction included the background to the planning and building of circuit boards and the significance and differences between the various electronic components, as well as practical advice about wiring, soldering and layout. As discussed previously, although the Videokalos did not offer any entirely new possibilities for video production, it combined facilities which were otherwise not available in a self-contained compact unit. The acquisition of the prototype enabled me to considerably extend the range of image-control processes available in my studio. 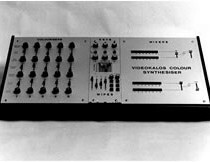 This innovative and unique instrument was influential on my developing attitude to the medium, reinforcing my understanding of the instantaneous and fluid nature of the video image, its production processes paralleling those of audio recording. The rebuilt prototype Videokalos was, until the addition of a digital frame store and time-base corrector in 1987, the image-processing hub of my video studio. It was used extensively in image work during the production of the following tapes: The Room with a View (1982) Time Travelling/A True Story (1983) Interlude (Homage to Bugs Bunny) (1983) Still Life with Monitor (1984) and The Stream (1985-87). My work with the Videokalos in this period differed from my work with it during the landscape series as it was not used as a camera mixer, but rather as an image processing device, modifying images in a variety of ways including colour balance, contrast and saturation, luminance (brightness) adjustments, luminance keying, the keying of captions, image fades, monochrome effects, and the addition of ‘colour burst’ to black and white images. The Videokalos gave me limited, but significant control over the video picture providing me with a sense of video as analogous to the audio signal, controllable in a fluid and malleable way. I understood video not as framework of discrete ‘units’ of time to be cut and pasted, but as a shifting stream of signals which could be controlled in a way that a musician controlled sound from an instrument. Video- like music, was instant, interactive, direct and fluid. With this level of image-control in my own hands, literally, it became a part of my image repertoire. Working with it daily, I learned to use it instinctively, and my sense of the medium was significantly influenced by its integration into the making of my work during this period.